Semi-automatic system uses an electric shuttle to load and unload the pallets inside compact racks quickly and accurately. The Pallet Shuttle is a high-density storage system where a shuttle, powered by an electric motor, runs along rails inside a storage channel. By replacing forklifts, this radio shuttle solution considerably reduces operating times and enables SKUs to be grouped by channels rather than by entire lanes. The shuttle follows orders sent by an operator through a WiFi connected tablet. It deposits its load in the first free location in the channel, while compacting the pallets as much as possible. Not having forklift traffic inside the lanes increases storage capacity in terms of depth and decreases the risk of accidents. Damage to the shuttle racks is then negligible, operator movements are optimized and warehouse operations modernized and made more flexible. An ideal solution for companies handling high volumes of single-SKU pallets, as well as intense loading and unloading activities. Greater diversification since each channel houses a different item. High productivity through increased inflows and outflows of goods. Greater capacity, i.e. deep store pallets in up to 131 ft lanes. 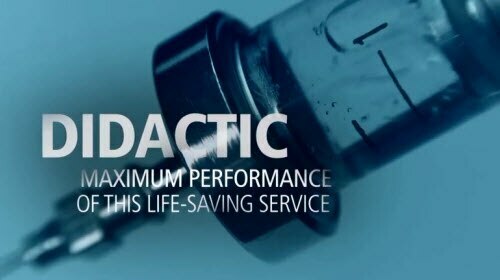 Highly cost-effective, thanks to reduced operating costs. Multiple advanced funtionalities easily controlled from a single tablet. Store more pallets deep, since channels can stand more than 131 ft high. The maximum verticality is determined by the handling equipment used. The system works with minimal clearances between levels, which permits high-density storage. Built-in sensors on the shuttles help position loads intelligently, eliminating empty spaces in the storage lanes. As a result, the effective capacity of the warehouse (which considers goods flowing in and out of the warehouse) reflects its physical capacity. Loading and unloading times are reduced, since the operator does not have to move around inside the lanes. The shuttle can travel at speeds of 295 ft/min when empty, or 148 ft/min when loaded. With just a single command, the shuttle can progressively fill or empty a whole lane. More goods flowing in and out of the warehouse. Unlike standard drive-in systems, items can be grouped by channels, rather than requiring a full lane. Greater product diversification is the result. Optimization of operator movements through the product-to-person system, i.e., the load that moves to the operator. While the Pallet Shuttle carries out a command, the operator collects another pallet, achieving continuous workflows. Depending on temperature and load conditions, the shuttle can operate up to 10 hours, working at full performance. The easy-access lithium batteries have fast connections, makeing them cable-free. So, battery units can be changed quickly without interrupting the operational cycle. The shuttle rack system is easy to use and maintain. Inventory function means the shuttle counts how many pallets are stored in a channel. 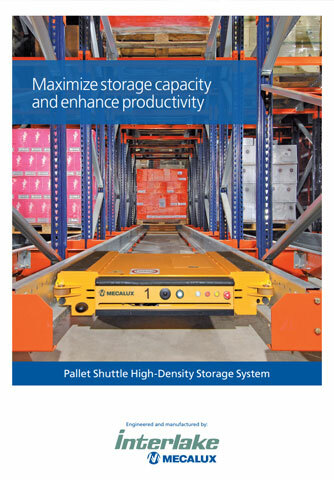 These benefits, combined with its efficient energy use, lead to immediate cost savings, making the Pallet Shuttle one of the most cost-effective compact storage systems around. The 4048 and 4840 Pallet Shuttle models work with different pallet sizes and widths. For example, the 4048 model can handle 40 inch deep pallets (and around 48 inch front ways). The 4840 model can handle 48 inch deep GMA pallets. All shuttles can operate in LIFO or FIFO mode. The operator simply selects the mode they wish to work with from the tablet. The shuttle platform is designed to carry pallets that have a 1 inch max. buckling limit. Any type of forklift can be used to handle the shuttle. Handle up to 3,307 lbs per pallet. Install the Easy WMS Interlake Mecalux Warehouse Management System Easy WMS on any compatible operator tablet. As a scalable system, it is easy to increase the number of shuttles in operation to match increasing productivity needs. Thanks to the way that the structure is built, and given that forklifts do not need to drive into the shuttle racks, the risk of accidents is practically non-existent. The metallic bays are not damaged, thus maintenance is kept to a minimum. A user management feature prevents unauthorized personnel from operating the shuttles. Both the racking and the shuttles have built-in safety features specifically designed to ensure the Pallet Shuttle system operates correctly: rail end stops, pallet centralizers, position sensors, etc. Interlake Mecalux designs and manufactures all the individual components of the compact Pallet Shuttle storage system, including the special shuttle rack structure to ensure streamlined shuttle movements. We also manufacture our own shuttles. This guarantees flawless operationsand a perfect fit of all the system's different components, as well as their quality and compliance with the safety regulations in force in each country. Thanks to the resources invested in R&D&I, Mecalux’s Pallet Shuttle includes the latest technological innovations, offering optimal performance at a very competitive price. It has innovative features, including remote tablet control, a positioning camera and safety scanner. As one of the fastest systems on the market, it can be adapted to the specific needs of any warehouse, making it even more efficient. Interlake Mecalux provides a five-year warrantyfor the Pallet Shuttle rack structure, a one-year warranty on the shuttle's operations, and six months on the batteries. By definition, a shuttle is a fast means of transport that travels between two fixed points at frequent intervals. Mecalux’s Pallet Shuttle fits this description precisely. However, its journey starts at the front of the racks up to the first available space in the storage channel, and back again (vice versa operation to unload). Eventually, the evolution of compact storage systems raised important questions. Such as, why not use a motorized shuttle to handle pallets, instead of a forklift that drives into the storage channel? Why not use technology to increase loading and unloading speeds and optimize the effective capacity of a warehouse? The smart choice was the Pallet Shuttle. Adapted rack structures mean an electric run shuttle can move inside storage lanes along a track, following the commands given by the operator using a WiFi control tablet. The forklift simply leaves the load on the tracks, and the Pallet Shuttle picks it up and moves it autonomously. Pallets are kept as compact as possible, while each pallet is slotted in its location. Since forklifts do not need to drive into the lanes, handling times are lower, storage capacity is higher and deeper. Additionally, damage to the metal shelves is negligible, operator movements are streamlined and in-warehouse operations moderized. In other words, the Pallet Shuttle system offers a compact storage solution that reduces operating costs and improves supply chain performance. Intelligent warehousing at its best. In semi-automated installations, operators only run the forklifts that carry the pallets and also activate the motorized shuttle. 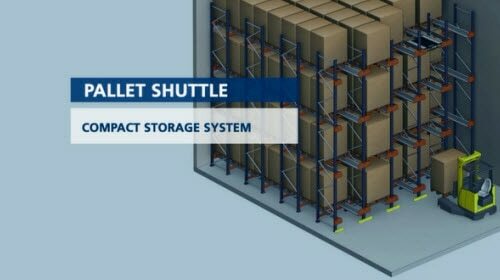 Otherwise, the movement of the shuttles inside the racking is automated. A forklift places the Pallet Shuttle into the channel where work is to be done. Using the tablet, the operator sends a command to the shuttle to start the loading operation. Once the pallet's location has been identified, the Radio Shuttle lifts the pallet slightly upward. It then moves horizontally until it reaches the first available location, where it deposits the pallet. Different sensors accurately control the movement of the load being stored. The Pallet Shuttle returns to the front of the lane to repeat the operation with the next pallet, and so on, as many times as needed until the channel is full. Before the front position is filled, the shuttle is removed from the lane and the sequence repeated in the next channel where work is required. Vertical beam components that can be adapted to a wide range of load requirements. 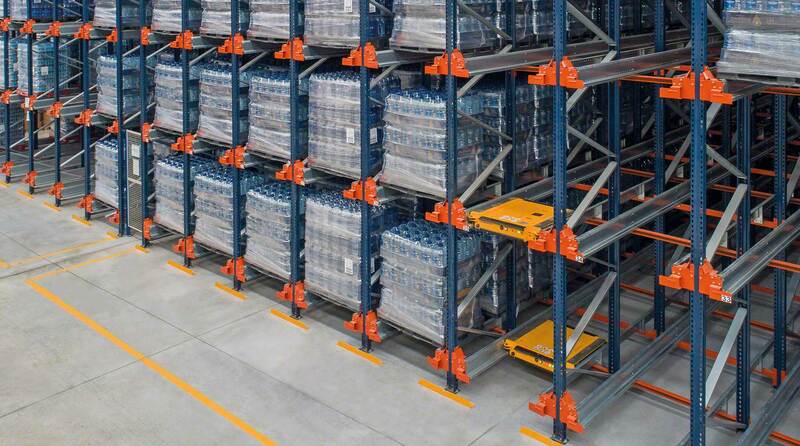 Horizontal, robust racking components on which loads are deposited. The Pallet Shuttle runs on rails inside the storage channels. Their design facilitates centered pallet and shuttle loading. Used to fix and anchor the rails on each load level to the frame's entry/exit upright. Used to fix the rails to the beams, except at the channel's entry/exit point. L-shaped 0.20- to 0.31-inch thick folded steel components detected by the shuttle, signaling it to slow and stop under normal working conditions. Fitted to the entry/exit points in the storage channels, these aid unit load slotting in the channel and ensure the load is centered. The shuttle runs smoothly along the inner lane thanks to these wheels. As such, it can shift the palletized goods properly. Guide the radio shuttle in a lengthwise direction. Prevent possible collisions or incidents resulting from improper operations. resulting from improper use. Receives orders transmitted from a control tablet via WiFi . Installed on either side of the Pallet Shuttle for safer control over channel access while the shuttle is in operation. The system lifts pallets through the platform, facilitating pallet movements. A flashing light which warns if a problem occurs with the shuttle. Indicates the battery level to show when they need recharging. Shows if the device is on or off. Ensures the Pallet Shuttle stops for preventive maintenance tasks. Detects the position of the Pallet Shuttle at the channel's ends. Helps the operator center the shuttle between the lateral rails. Detects the position of pallet loaded on the Pallet Shuttle, or those that were deposited in the lane. Fastens the shuttle onto the forklift's lifting blades, preventing it from moving around when moved. Where the last pallet loaded is the first to be unloaded. Loading and unloading is carried out from the same aisle. It is the most commonly used solution with the Pallet Shuttle system. Where the first pallet loaded is the first to be unloaded. Two access aisles are needed, i.e. one to load the goods and another to unload them. As a FIFO or a storage by batch system, it is recommended for completely loading or unloading a level. Select the type of pallet to be handled. Select the load management strategy. Select which side of the structure you want to work on (i.e. FIFO mode). Activate the additional locking system, which increases contact between the Pallet Shuttle and the forklift's forks. Group pallets at the beginning (LIFO) or end (FIFO) of the channel. Loads or unloads a channel without stopping. Select the number of pallets to be extracted. Count the number of pallets stored in the channel. Activate the acoustic and light signals to identify the selected shuttle's location. Manage shuttle user permissions for authorized personnel. Shows the number of shuttles in operation and their statuses. Detect if the shuttle is incorrectly positioned in a channel. Recover a damaged shuttle from inside the channel. Facilitate the Pallet Shuttle's insertion on the rails. In general, the Pallet Shuttle noticeably increases warehouse productivity when working with incoming and outgoing goods with many pallets per item. Companies with massive loading and unloading activity. Cold storage systems are highly-suited to warehouses where products need low temperatures, since storage volumes are fully used and handling times reduced. Installing an AS/RS makes the system even more efficient, through stacker cranes and shuttles. Buffers for picked orders or temporary storage. Seasonal product warehouses, where inflows and outflows depend on the season. So, goods accumulate over a period until a deadline when all must be released en masse, for example, ice cream or toys. rehouses that already use a compact system and need access to a greater number of SKUs, to store ore pallets deep or increase the number of incoming and outgoing movements, tall to increase productivity.